Note: Who can do this workout with 35lb. Dumbbells and achieve 10 or more rounds? Congratulations to Glenn Johnson on his recent accomplishments in the gym. 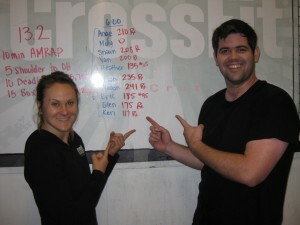 During the CrossFit Games Open WOD 13.2, Glenn achieved a long time goal of performing a CrossFit Games Workout “As Prescribed”. Great job Glenn, and thank you for continuing to be a shining example of what hard work and dedication can accomplish.